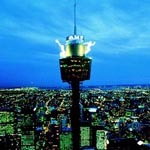 The AMP Tower, also known as Sydney Tower and the Centrepoint Tower, is Sydney's tallest building and a prominent city landmark. The tower boasts the highest observation deck in the Southern Hemisphere, and being considerably taller than other nearby buildings, provides unobstructed views over Sydney Harbour and Downtown Sydney. Access to the observation deck is on a fee basis with daily opening including evenings. Viewings at sunset and after dark are particularly spectacular. Office spaces, restaurants and a shopping centre occupy the remainder of the tower complex.